Offering you a complete choice of products which include gabion box. We are offering a quality range of Gabion Box to our valued clients. 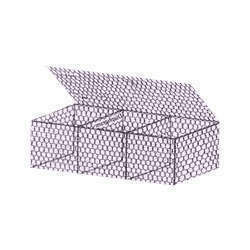 These crates are fabricated using twisted hexagonal type and double knotted square type wire mesh. The wire mesh is usually manufactured using a 3 mm galvanized wire or PVC coated wire with a 100 mm aperture. We provide these crates in the specified size and internal partition for respective requirements of our clients.